Copicucullia basipuncta Barnes and McDunnough, 1918, Contrib. Nat. Hist. Lep. N. Am., 4(2):100, pl. 16, fig. 5. Diagnosis: Cucullia basipuncta is the first of two closely related species from the western United States; the other is Cucullia mcdunnoughi. The apophyses anteriores in both species are double and y-shaped. The ductus bursae in both species is wide relative to its length and the sclerotized area lacks the ridges found in other species in the genus. The male valve of both species is strongly sclerotized and the clasper is located near the apex of the valve. The corona is absent. 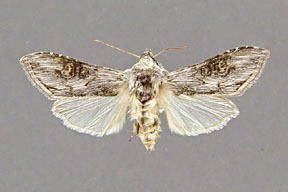 Both species are light gray with blotches of black, particularly on the forewing costa between the reniform and orbicular marks. 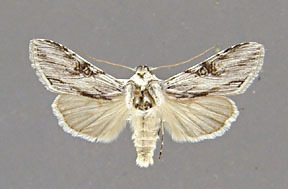 Cucullia basipuncta and mcdunnoughi are superficially similar; the main difference is in the strength of the forewing postmedial line. The postmedial line of basipuncta is apparent all the way from the costa to the inner margin, but is distinct only in the lower half of the wing. The postmedial line of mcdunnoughi is completely absent. The best differences between the two species are in the male genitalia. The apex of the valve is produced into a blunt spine in mcdunnoughi but is not in basipuncta. The clasper is also larger in mcdunnoughi and its tip touches the costa of the valve. 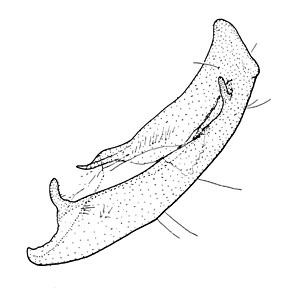 The clasper is much smaller in basipuncta and comes no where near the costal margin of the valve. The affinities of these two species are problematical. 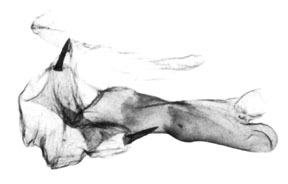 They share the tibial claw and general superficial appearance of antipoda and incresa, but the male and female genitalia are highly modified. Wing length from base to apex: mean = 15.75 mm., standard deviation = 1.03 mm., n = 10. 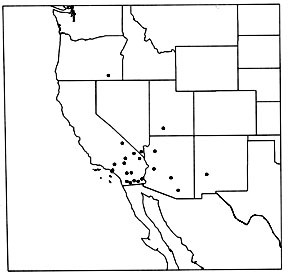 Distribution: Cucullia basipuncta has been mostly commonly collected in the Mohave Desert region. The species has been collected widely in southern California from the Mexican border throughout the Mohave region, as far north as Inyo County. It also appears to be fairly common in southern Nevada and western Arizona. There are also single specimens from more scattered localities. It has been collected in Harney County in southeastern Oregon, Garfield County in south-central Utah, Pima County in south-central Arizona, and as far east as Lincoln County in central New Mexico. There seems to be some within population variation in the male genitalia. In specimens from Palm Springs, the type locality, the clasper varies from absent to moderately developed. Males and females are sexually dimorphic for hindwing color. 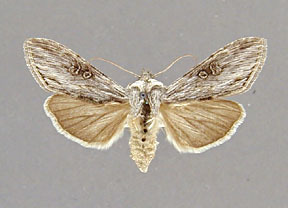 The male hindwing is pure white, but the female hindwing is suffused with brown. Adults have been collected from March to late May. 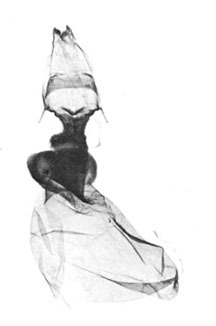 Larva: The larva has been described and figured by Comstock and Henne (1943). The larval color is variable from light green to dark gray. There is a dorsal yellow stripe and a lateral wide, white band. Foodplants: The larvae were reared on Stephanomeria runcinata, an herbaceous composite.